This disc brings together some of the loudest, most exciting music ever written – neither music, nor your hearing, will ever be the same! An explosive collection of great tunes, driving rhythms, and sonic thrills. The music has been arranged for continuous listening. With that in mind, three quiet “valleys” have been programmed to provide contrast with the very loud music that follows them. You may find that the contrast actually adds to the excitement. The final track, Hekla (by Jón Leifs), is probably the loudest single piece of music ever written. It describes, in very graphic terms, the eruption of Hekla, Iceland’s largest active volcano. 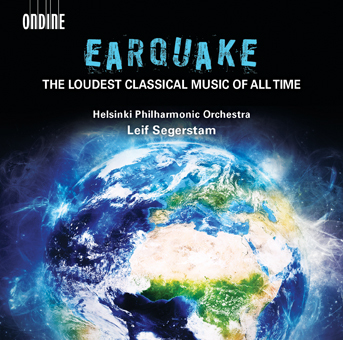 The 140 piece Helsinki Philharmonic Orchestra under Leif Segerstam includes, among others, a 22-person percussion section, four sets of rocks hit with hammers, two heavy metal chains, anvils, steel plates, sirens, and several dozen cannon shots.